PAL Version Review by SKTTR. If you're looking for a 3D platformer with great gameplay and content, nice graphics and a big soundtrack for a low price then check out this Armillo review. You get thrown into a story about robots (with evil voice acting) taking over planets and Armillo, the space armadillo is there to help the friendly inhabitants and stop the mechanoid invasion. Some neat plot twists included. From the world screen you can watch your progress, go on shopping, or select a stage. The spherical stages are in full 3D and as Armillo you can roll, jump, and boost your way through them. It's not a totally free environment, as the numerous areas are closed by some sort of rail you cannot jump over. In that way most stages are linear which is sweet for not getting lost, and great for speedrunning. And even with its straightforward gameplay it still manages to add many wellhidden secrets and a few alternate paths. So you roll around the paths from one confined area to the next, activate checkpoints on your way, jump over obstacles, boost into enemies, solve puzzles, rescue the cute creatures, collect orbs (the currency of the game), and find secrets. All in all there's a great variety of planets. 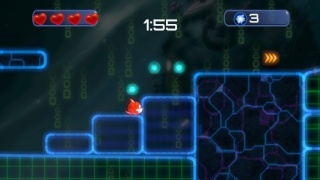 Every stage has its own theme, with new elements appearing all the time keeping gameplay fresh. Each planet even has its own music track. And you can play the game either with motion controls (tilting the GamePad) or classic controls which are easier. But technically Armillo is a bit rough on the edges: the framerate drops in some scenes and many of the scores you need to get a medal for are wrong. There are two creature counters on the world map screen as well, which is odd because it's useless. Thankfully a patch is on its way. In between stages you can visit the shop where you buy permanent power-ups like extra-lives, extra-energy, more time for the timed areas, a better boost, etc. Sections that at first seemed difficult or impossible to reach will be easy once you upgrade your little critter. 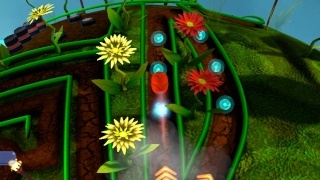 Many 2D bonus levels wait to be found as well. In them you run against the clock, collect as many orbs as possible and get to the exit before the time runs out. 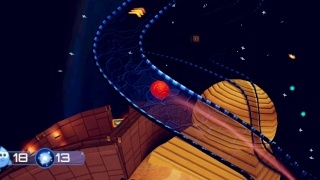 These neon style stages have some retro-inspired music and floaty controls. Takes some time to get used to it. Well, it works, most of the time (got stuck in a wall once, not being able to get out). Needless to say these stages get really difficult, especially if you want to collect all orbs. All in all it's a very recommendable game for 3D platformer fans. It took me 12 enjoyable hours to get to 81% and there's still 19% left to do. I have to wait for the update though because with that bug on the medal scores it seems Armillo is not fully beatable. But for just 4.50€ you should check this game out anyway! Kushina wrote: Beautiful review SKTTR! Indeed, nicely done @SKTTR and thanks for the help! I'm loving this game so far it's one of the only 3D platformers on the eshop right now so it was an obvious download and I don't regret my decision. The only thing that I don't like is that some levels are impossible to earn a gold medal on. Great review man! Excellent review @SKTTR! Are the lag issues exclusive to the PAL version of the game? @Link_i_am wrote: Excellent review @SKTTR! Are the lag issues exclusive to the PAL version of the game? From what I know both versions are identical. I was just given the opportunity to share my own perspective on it, and since I'm from Europe I got the PAL version to review.